The Dispossessed is Le Guin's view of an anarchist utopia. And yet, it isn't exceptionally creepy or too horribly far-fetched. That's because her utopia isn't a completely perfect society where everyone is equally happy. It's just better. We see both Anarres (the anarchist society) and Urras (the not really veiled at all analog of America) through the eyes of Shevek, a particularly thoughtful scientist. He's a good narrator, because he is thoughtful and likeable, though flawed and usually naive. 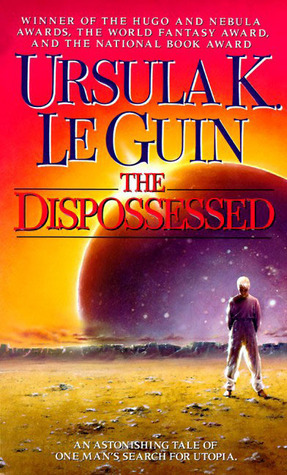 Sure, the plot is the weakest part of the book, but this seems to have been intended as the author's idea of how an anarchist society left to its own devices would fare after a century, and not as a plot-heavy work of SF. And because it is an unusually thoughtful novel of ideas, it did work for me. And, of course, beautifully written. Not many authors would take the time to add in a convincing love story, like the one between Shevek and his wife. For me, and probably for a lot of other readers, what stuck with me about Anarres is not the perfection of the idea. That can come off as slightly creepy at the hands of some authors, when characters start to act like automatons. Le Guin resists that urge, and certainly put a lot of thought into how her society could be corrupted and dragged down by basic human nature. And yet, it's still better than the alternative. It's that thoughtfulness that makes this novel of ideas far, far less preachy than it could have been, and probably should have been.